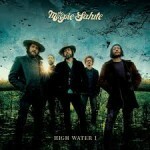 Share the post "Album review: THE MAGPIE SALUTE – High Water 1"
Saluting the magpie is an old English country tradition meant to ward off unsavory events or bad tidings and is, by extension, a symbolic gesture of “coming in peace”. Delving into the background of this band, its members and the history of the players, one is dialed into a group of individuals which is positively and cathartically reveling in its musical union. Combining relationships old and new-ish, experience aplenty and a heartfelt and authentic respect for the two most musically creative decades (‘60s/’70s) in the history of popular music, The Magpie Salute launches its first full album of original material with High Water 1, following 2017’s self-titled debut release. The beauty of a band like The Magpie Salute is in its fusion of contrasts and contradictions – you know what you’re going to get but also never know what to expect, some of the personal histories have been fractious in nature but glorious in output and the roots of the golden era of the ‘60s/’70s are somehow indelibly connected to 2018 like a musical umbilical chord. Old cohorts from the Black Crowes, guitarist Marc Ford and bassist Sven Pipien, join Rich Robinson and fellow collaborators in vocalist John Hogg, keys man Matt Slocum and drummer Joe Magistro (whose solo output with The Prophet Omega is well worth checking out) and have blended The Magpie Salute into a band at sonic peace with themselves – and when that happens, it’s less about capturing lightning in a bottle and more about letting the chemistry flow organically to link multiple lightening bolts from a bygone era – creating music freely and spanning the generations. These tracks are littered with references not just to the greats, but to the greatest era with the central hippy themes of love, social cause, peace and community permeating this excellent album throughout. Opening with “Mary The Gypsy”, a track on which Rich out-Riches Rich with one of his typical driving riffs, a tip of retro hat to Dylan’s vocals on the Highway 61 album but with an almost garage-punk attitude. Title track “High Water” is for me the standout track of a consistently exceptional album featuring a lovely rumbling acoustic background groove a bit like Zeppelin might have stumbled across on a Welsh hillside and a very strong and slightly trippy vocal arrangement reminiscent of The Byrds. The song rises and builds like a tsunami – so typical of the Salute’s knack for chilling it and then knowing when to be killing it. Similarly, “For The Wind” with its beautiful descending acoustic into and signature Robinson chord progressions – it’s the one you’d play to an alien landing on earth and wanting to know what all the fuss was about the Magpie Salute. “Sister Moon” is a swoony and melancholy piano-driven ballad overlaid with exquisite lap steel whilst “You Found Me’ comes right out of the Stephen Stills/Manassas playbook – brilliant. Likewise, “Open Up” has a moody, CSN first album feel and “Walk On Water” is possibly the poppiest of the bunch – very catchy with an understated but crucial slide riff. There’s also the cutesy fun little honky-tonk rag “Hand in Hand”. This entry was posted in ALBUM REVIEWS, ALBUM REVIEWS (Mobile), All Posts and tagged album, Back Crowes, blues, High Water 1, melodic, review, Rich Robinson, rock, southern, the Magpie Salute. Bookmark the permalink.